With up to 20cm in some places, Britain continues to be beset by snow ! Fresh heavy overnight snow brought renewed travel chaos to Britain today, creating paralysis on motorways, the rail network and at the airports. Let's take stock of this situation. Due to the current weather conditions, Eurostar will be operating a significantly reduced timetable on Thursday 2 December, with a number of cancellations. The company claimed they are trying to cope with the conditions but half of the services to Brussels are cancelled and there are delays of up to 60 minutes because of snow in Kent and in northern France. Eurostar announced delays and cancellations on Wednesday but the traffic is even worse today due to the blizzard that has swept Europe. According to French media, nearly 50 percent of rail services linking Paris and London, Brussels and London will be reduced over Thursday. Therefore passengers are strongly advised passengers to postpone their journey if it is not essential, as free exchanges or refunds are offered. Such precaution measures are expected to avoid the huge problems encountered on December 2009, when over 2,000 passengers were stuck on board failed trains inside the Channel tunnel while all Eurostar services were cancelled for three days because of snowfalls. Britain's second busiest airport Gatwick Airport will remain closed all day today due to the severe weather conditions, with officials warning it will not reopen until at least 6am tomorrow. It has closed for the day as the early winter tightens its grip on battered transport systems across the UK. 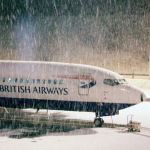 Efforts to clear the runways at Gatwick overnight failed in the face of repeated falls of fresh snow. The closure has disrupted the travel plans of 250,000 passengers. As the level of disruption continued to escalate across the country, the government ordered an urgent audit of the country's snow-readiness, and Philip Hammond, the transport secretary, criticised poor communications that stranded motorists and passengers. The runway at London's City airport will also remain closed until noon. However the situation should be getting better and better towards the weekend as temperatures are expected to rise slightly. Snow is definitely a godsend for Scottish pupils as schools in Edinburgh and Dundee are shut today. But some unshakeable schools across Scotland are continuing to teach pupils stuck at home through a national website – the schools intranet GLOW – and their own internet pages. Bad luck! For most, this is the perfect excuse to stay at home, building snowmen and enjoying a hot toddy by the fire...waiting for Christmas.